Dominique Boissy — Recorder and harpsichord. 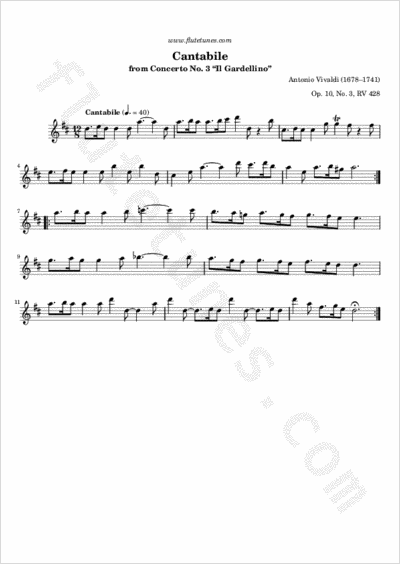 The Opus 10 concertos constitute the most significant repertoire that Vivaldi composed for flute. In Concerto No. 3 in D major, RV 428, the Italian composer demonstrates his perfect understanding of the instrument, writing trills, leaps, rapid florid passages, repeated notes, dotted rhythms, all of which evoke the warblings of a real goldfinch (a “gardellino” in Italian). Today we present the second movement from this concerto, marked Cantabile (‛singable’). It features the flute in a beautiful cantilena in siciliano rhythm over a rocking accompaniment.